This past weekend was our very first wedding anniversary and I don’t think there is any better match for me than Cornelius — he’s my most perfect fella. Last June 25th, we tied the knot in a small little ceremony with all of our friends and family present (well, minus my dad who was too afraid to fly across country). The ceremony and reception was held at an indie gallery/diy workspace called Blim and it was a truely d.i.y. affair, with lots of homemade food and cake, dancing and way too much beer. My dress was handmade out of a set of vintage drapes and I even embroidered on a leaf and flower pattern on the skirt out of colourful buttons and left over fabric. Of course, Cornelius looked handsome in his pink shirt and grey suit found in a Seattle vintage shop. The day was lovely and perfect and way better than anything we could have dreamed up. 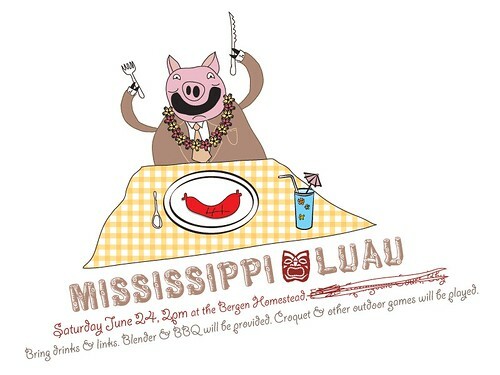 So when the date for our anniversary came around this year, we figured what better way to celebrate than to throw a party….a Mississippi Luau, in fact! We hustled around picking up decorations and groceries and lots of liquor (for the pina coladas and mint julips, dontcha know) and set it all up at Cornelius’ (vacationing) parents house in the suburban wilds of Burnaby. Yes, we did ask permission. On Saturday, friends gathered and games of croquet and bocci ball were played and lots of food was grilled and eaten. A most perfect anniversary celebration, I think. Out of all the food at the party, I was especially proud of my two desserts, the blue hawaii coconut cupcakes and the Chocolate/Bourbon Pecan Pie. 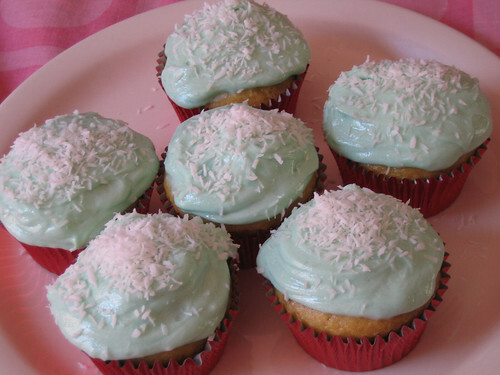 I made these vegan cupcakes awhile ago but the pie was a first and very successful. I did run out of corn syrup and I substituted 1/4 cup of maple syrup which I wouldn’t recommend…unless you leave out the bourbon. Just too many competing tastes! Just stick to the recipe and you’ll do fine. 1. Preheat oven to 375°F. Line pie crust with foil. Fill with dried beans or pie weights. Bake until crust edges begin to brown and crust is set, about 17 minutes. Remove foil and beans. Bake until golden brown, pressing with back of fork if crust bubbles, about 5 minutes longer. Transfer pie crust to rack. Maintain oven temperature. 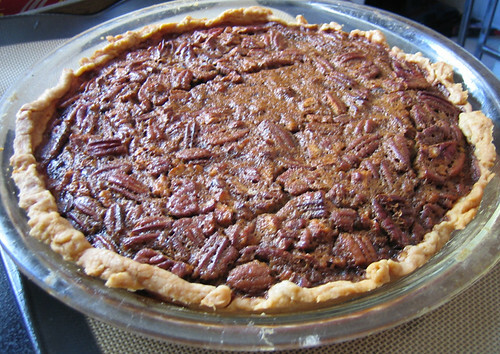 If your pie crust is storebought, I’d just skip this step and put the filling right into the frozen pie crust. 2. Beat sugar and butter in medium bowl until smooth; beat in flour. Gradually beat in corn syrup, then bourbon and vanilla. Mix in eggs, then chopped pecans. Sprinkle chocolate chips over bottom of crust. Pour filling into crust. Happy Anniversary! (raising my glass)….Here is to many more wonderful years!!! What a wonderful way to celebrate! Cheers! Happy Anniversary! I love the invite. I would love to see pictures of your dress. It sounds fabulous! Happy anniversary! Sounds like a great party! Fabulous!! Congratulations! Thank you for sharing this happy news with us! Sounds like a great party. Happy Anniversary. Happy 1st Anniversary to you both! Sounds like a swell soiree! Ain’t love grand? awwww, thanks everyone for all your comments and well-wishes! Happy Anniversary! Your parties are hard acts to follow: imagine the 50th! !